Jackson Hulme equalised for Blackpool Wren Rovers with the final kick of the game at Euxton Villa but they have lost the initiative to leaders Garstang in the West Lancashire League title race. Needing victory yesterday to reclaim top spot in the premier division, Wrens fell behind to Luke Walker’s strike in the dying seconds of the first half. Joe Booth equalised on the hour but Michael Galliers’ penalty five minutes from time looked to have won it for Euxton. However, Hulme’s strike in the fifth minute of stoppage time cut Garstang’s lead to a single point after they had claimed top spot on Saturday with a 5-0 thrashing of Slyne-with-Hest. Ric Coar’s goal was all that separated the sides until the 72nd minute but then Kieran O’Connor, Alan Coar (2) and Ryan Dodd stretched Garstang’s considerable goal difference advantage over Wrens with just one game to play. Only a win against Longridge on Saturday will keep Wrens in the hunt and leave Garstang needing victory at Tempest United next Monday to clinch the title. Wrens will host their match, which has been switched from Longridge. Thornton Cleveleys finished on a winning note yesterday as Dominic Lawson’s goal 10 minutes before the break sealed victory over Turton. Thornton bounced back from Saturday’s disappointing 3-1 defeat at home to Tempest, whose scorers were Chris Farnworth, Peter Lancaster and John Fraizer. Poulton moved back into pole position in the first division title race with yesterday’s 3-2 win at Hawcoat Park. Their lack of Saturday action had seen Poulton fall behind Hurst Green and CMB into third spot, but goals by Louis Shields and Max Landless (2)in Cumbria put them back in the driving seat. Hurst Green had hit the front on Saturday by seeing off Lostock St Gerard’s 4-1, while CMB had gone second with a 2-1 victory over Askam United. But now two wins from their remaining three games will seal the title for Poulton. Wyre Villa’s season ended on a miserable note as they followed a 6-0 defeat to GSK Ulverston Rangers with yesterday’s 9-1 thrashing at Stoneclough. The season is drawing to a close in the Bathroom Solutions Blackpool and Fylde Sunday Football Alliance, with the fixtures in divisions one and two now complete. Derby rivals Station Lytham and Wesham faced each other for the second time in seven days in division one and it was the hosts Station who completed a treble over their local rivals. Wesham led at half-time after Dwayne Greenwood was tripped in the box and Jordan Cole slotted home the penalty. Station made changes for the second half, one of which was to introduce Charlie Dixon, whose first touch saw him smash home the equaliser to finish a great move. Ben McKay then scored a quickfire brace to make it 3-1 to Station. Wesham were awarded a second penalty and again Cole stepped up, but this time Aiden Ward-Smith made a fine low save. Harry Greenwood sealed the victory with a fourth for Station. There was a hat-trick for Barry Davenport and a brace for Antony Buxton as Bloomfield Brewhouse ended their season with an 8-1 win over Exceptional Kitchens. 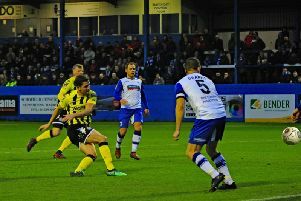 Stewart Ralston, Ben Perry-acton and keeper-turned-striker Carl Dixon completed the scoring, while Neal Williams scored the consolation. The win leaves Bloomfield in fifth spot, level with Blackhurst Budd who were beaten 5-1 by third-placed FC Shovels last Wednesday, when Arron Fleming scored four. Connor McGough netted the other and Budd’s Ric Seear replied. The final two premier division matches involve The Saddle, who could climb to fourth. Broomheads Estate Agency face Blackhurst Budd in tomorrow’s all-Alliance final of the Lancashire FA Sunday Trophy in Leyland. Fleetwood Town’s Highbury Stadium stages the Berry’s Beds divisional cup finals on Sunday, when Clifton Rangers v Westview (division 2) gets the ball rolling at 10.30am, followed by E&P Publications v Station Lytham (division 1, 1pm) and Blackhurst Budd v AFC Additions (premier, 4pm)..